A small portion of the brown sugar-sweetened bourbon and mustard glaze is rubbed just beneath the skin directly onto the breast meat in readying the bird for roasting. This holiday-perfect roast turkey recipe includes directions for roasting a stuffed turkey and for making a delicious gravy using seasoned giblet stock. For Bourbon & Mustard Glaze: Stir together in a small bowl 1/4 cup of the bourbon, 1/4 cup of the mustard, and 1/4 cup of the brown sugar. Set aside. Prepare cornbread stuffing or the stuffing of your choice. Preheat oven to 325°F (160°C). Place a lightly oiled rack on the bottom of a large roasting pan. Lightly oil a 2-quart baking dish. Spoon about half the corn bread stuffing into the turkey and neck cavities, securing the neck cavity with a skewer. Transfer the remaining stuffing to the prepared baking dish, cover with aluminum foil and refrigerate. With your fingers, separate the turkey skin from the breast meat, taking care not to tear the skin or pierce the meat. Rub about half the glaze under the skin onto the breast meat; set aside the remaining glaze. Season the bird with salt and pepper. Tie the drumsticks together and tuck wing tips behind the back. Place the bird, breast side up, in the prepared roasting pan. Cover with lightly oiled aluminum foil and roast for 2 1/2 hours. Remove the foil, brush the turkey all over with some of the reserved glaze and baste with pan juices. Continue roasting, uncovered, 1 1/2 to 2 hours longer; brushing with glaze and basting from time to time. The turkey is done when a meat thermometer inserted into the thickest part of the thigh registers 180°F (85°C) and registers 165°F (75°C) when inserted into the stuffing. To Make Giblet Stock: While the turkey is roasting, heat oil over medium high heat in a medium saucepan. Add the giblets, neck, onions, and carrot; cook, stirring occasionally, for 10 to 15 minutes, or until well browned. Add chicken stock, garlic, parsley, thyme, peppercorns and 1 cup of water; bring to a boil. Reduce heat to low and simmer for 30 minutes. Strain through a fine sieve. (You should have about 2 1/2 cups stock.) Chill until ready to use. Skim off the fat. When the turkey is done, transfer it to a carving board. Scoop the stuffing into a serving bowl, cover and keep warm. Place the dish of extra stuffing in the oven to heat. 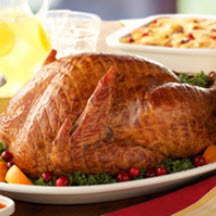 Cover the turkey loosely with aluminum foil and let rest for 15 to 30 minutes before carving. To Make Gravy: Pour the drippings from the roasting pan through a strainer into a small bowl, then chill in the freezer so that the fat can be skimmed off. Add the remaining 1/2 cup bourbon to the roasting pan and cook, stirring and scraping up any brown bits, for about 1 minute. Strain into a medium saucepan. Add the giblet stock and bring to a simmer. Skim off fat from the chilled pan juices before adding to the pan. In a small bowl, dissolve cornstarch in 1/4 cup water; slowly add to the simmering sauce, whisking until slightly thickened. Stir in the remaining 2 tablespoons mustard and 1 teaspoon brown sugar. Taste and adjust seasonings. Remove string from turkey and carve, discarding skin. Serve with gravy and stuffing.